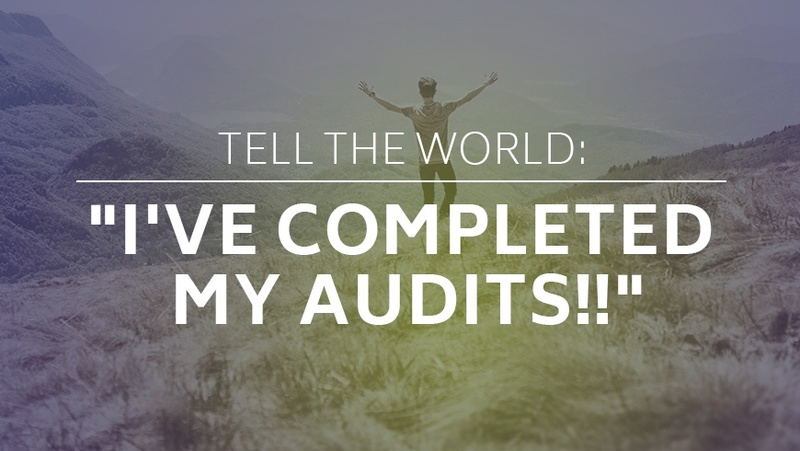 Tell The World: "I've Completed My Audits!!" Your customers and potential customers share data with you every day. Whether it’s an email address or more in-depth information like a shipping address or credit card information, they expect you to protect what they share. Your organization has completed the work of going through an audit or becoming certified, but that certification seal or certificate is likely sitting somewhere near the bottom of your website, away from view. If the only time you promote your certifications or completed audits is when a customer or potential customer asks about them, you’re missing a big opportunity. The certifications you have earned can do much more for your organization than sit in a filing cabinet or at the bottom of a website. When marketed effectively, these certifications can help give you a competitive advantage. Use these tips to promote them. Create a press release announcing your certification and distribute it to relevant industry publications. In the press release, include what your new certification is or what audit you recently completed, how it will benefit your customers or potential customers and how it aligns with your company’s security culture or practices. While most press releases use a standard formula of including information about the newsworthy item and a few quotes from top executives, make yours stand out by telling a story of how the certification will benefit your audience and what they can expect when working with you. If your organization has a blog, consider writing a blog post announcing the certification or completed audit. The post can outline items like what the certification is and how it will affect your customers, business or industry. Use the blog post to include any additional information that is not included in your press release, and provide a link to the post in the press release for more information. Don’t forget to post the information on your social media channels, if your organization is active on social media. Doing so can provide another avenue of exposure for those who may have missed your press release or blog post. For your current customers, consider sending an email of the announcement. Your sales staff knows the pain points and concerns of your prospects. Give them the tools to address those pain points and concerns by letting them know of any recent certifications or audits your company has completed. Instead of having staff cite audit reports, create talking points for them, without divulging sensitive information, that break down the ways your company is protecting data or abiding by a set of standards. Let your audience know security is top of mind for your organization by creating white papers or webinars that answer their questions. Take a look at this example from RackSpace. The company’s resource center is full of items explaining security settings and options—including security configuration options, security of data if hosted on RackSpace or a private datacenter—for customers and potential customers. Putting together documents that answer questions about how your company safeguards data or meets security requirements can give you a competitive edge and make it easier for customers and prospects to get the information they need. Don’t let your completed audit or certification badge gather dust at the bottom of your website or let the certificate sit in a filing cabinet. Get the maximum benefit from it and share your hard work with your audience.